Helping the community through the power of Hope. There was a vision given to a young man in 1997. The vision encompassed feeding the homeless and shut-ins. It included clothing those who were not able to cloth themselves. It is a vision wholistic ministry, meeting the needs of those who could not help themselves. This vision was the brainchild of George Frederick, and the name of the vision became HOPE HOUSE MINISTRIES. Hope House Ministries started operating in May of 2000, in the kitchen of the True Vision Church. The Church was located at 7900 IH 35 on Walzem and the now closed Wiendser Park Mall. Hope House Ministries is a nonprofit organization which provides a variety of social services to address the immediate needs of economically-disadvantaged and underpriviledged children and adults in San Antonio, TX. What originally started with five volunteers, preparing and delivering 30 meals to homeless people under bridges once a week, has expanded in nine years to preparing and providing meals to over 2000 clients including the elderly, sick, and disabled, and other individuals, and families requiring help. Hope House Ministries is now a separate entity. On February 13, 2004, Hope House Ministries received Certificate of Incorporation and on November 8, 2004, Hope House Ministries was given the IRS's approval for nonprofit 501(c)(3) tax exempt status. In the year 2013, Hope House Ministries reconstructed and opened a building on the eastside of San Antonio, TX, and continues to grow. Shortly after the birth of the Ministry, the volunteer began excepting used clothing items and started bundling and delivering clothing items to needy families. The funding is provided by several individuals and organizations. In addition to Hope House Ministries' feeding and clothing program, we provide counselling, and intensive rehabilitation programs, designed to help qualified participants to escape the grip of alcohol, drug addiction, unemployment, and hopelessness. With our community outreach program, Hope Workforce Ministry, we provide basic life-skills training to help people succeed in this world today. 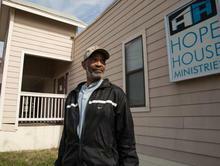 Hope House Ministries has been operating 25 years in San Antonio, TX. Hope House Ministries started out as a group serving hot meals and expanded into the non-profit organization it is currently, that offers programs that assist the community with, but not limited to, food, clothing, job placement training, and utility vouchers. Committed to helping the Community.